Finally got to Memphis after flying for more than 22 hours straight. Had to send BM a belated birthday wish coz stuck in the air. Oh well. The final stretch from Los Angeles to Memphis was the hardest as my knees were starting to ache badly at the joint from being in a immobilised bent position. The legs (no pun intended) from Hong Kong to Tokyo to Los Angeles were fine as I was upgraded to Business Class. Ahh... few would expect the humble footrest to be sooooo important. Snapped this photo of the First Officer of my flight from LA to Memphis. Damn "unglam" hor? All along we are used to the perception of the "glamourous" lifestyle of flight crew (especially pilots) but the sight in front of me, is probably a more accurate picture of actual reality. The flight crew himself looked so "unglam", nevermind what he was doing, sitting on the floor! 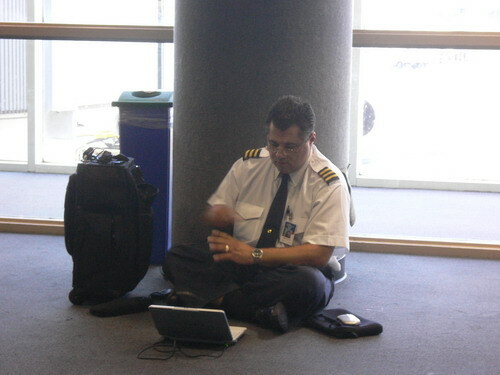 I hope he's a ground crew and not an air steward! Lynne: Like I said, he is the First Officer as in the right-hand man to the Captain aka Co-Pilot. You can tell by the 3 Gold Bars on his shoulder ampulet. Captain is 4 while second officer is 2. As for Elvis, I think you see more of him in Las Vegas these days, then Memphis liao. hhahaha. akk: Well, it's a good thing that they are not stuck up as compared to some that I have met. This one is certainly down-to-earth (no pun intended). Wah bro, lui pai tan ah... jet here jet there. Siong marn. Hang in there! vandice: You being in Chambana should know how painful it is to be flying long haul with numerous connections. My record was 13 planes in 11 days. I fly from Hong Kong > Tokyo > Seattle > Detroit > Greensboro > Detroit > Atlanta > Detroit > Dallas > Houston > Detroit > Los Angeles > Tokyo > Hong Kong. Now that's what I call siong!